← The I IS capitalized. I don’t play many 2D brawlers. I’d like to blame this on a generational thing – the genre more or less started with Double Dragon, and that came out right around the same time I stopped going to arcades. So, I never really got into the whole Bare Knuckle / X-Men / Simpsons Arcade /etc thing. A friend and I DID quarter-feed our way through “Captain America and the Avengers” back in the day, but that’s kind of an exception. Anyway, I’d like to blame it on a generational thing, but the truth is that I’m just not very good at them. Something about the way my depth perception works means that I have a terrible time figuring out when I’m on the same plane as the enemy characters, and I tend to spend a lot of time punching the air. 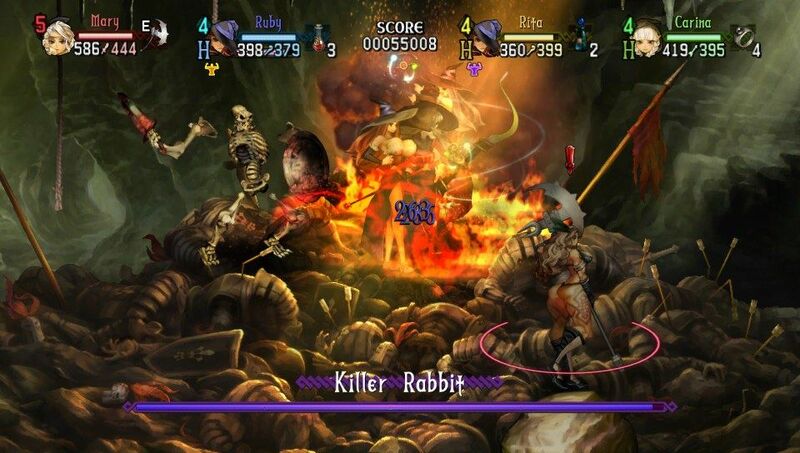 Nonetheless, it turns out that the Vanillaware name will sell me on a game even when it’s in a genre that, as noted, I’m not very good at. 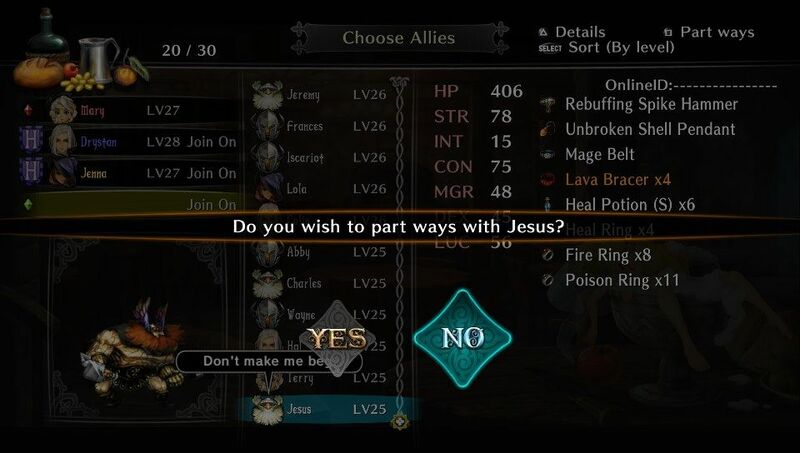 So, Dragon’s Crown. This was originally supposed to be, I believe, a Sega Saturn game, so it was in the oven for some while before its Vita release. Over the years, it’s become infamous for its, er, “relaxed” approach to actual human anatomy in favor of Frazetta-would-blush fantasy anatomy. 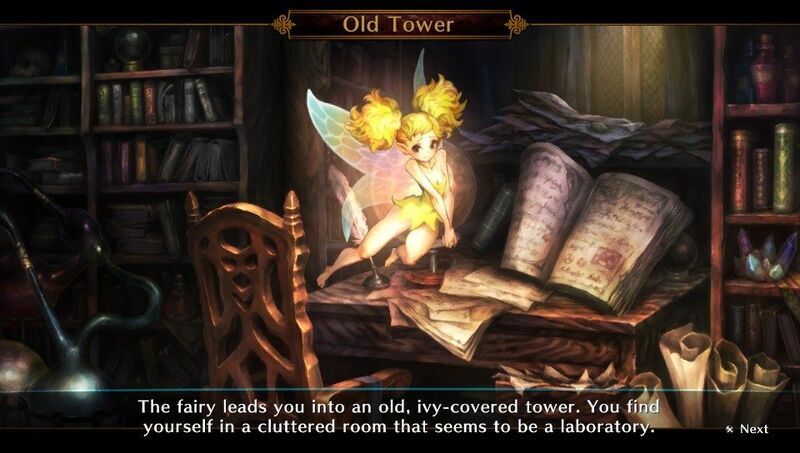 I actually quite like this little fairy, who you rescue in one of the early missions. Anyway, now that we’ve gotten that out of the way, let’s talk about the actual walking across the screen and hitting things bit. You get to choose one of six classes, which are rated by ease of use. I went with the Amazon class because it was listed as the class for absolute beginners. You get a Big Dang Axe and it’s a very mobile class with lots of jumping and dashing and spinning. 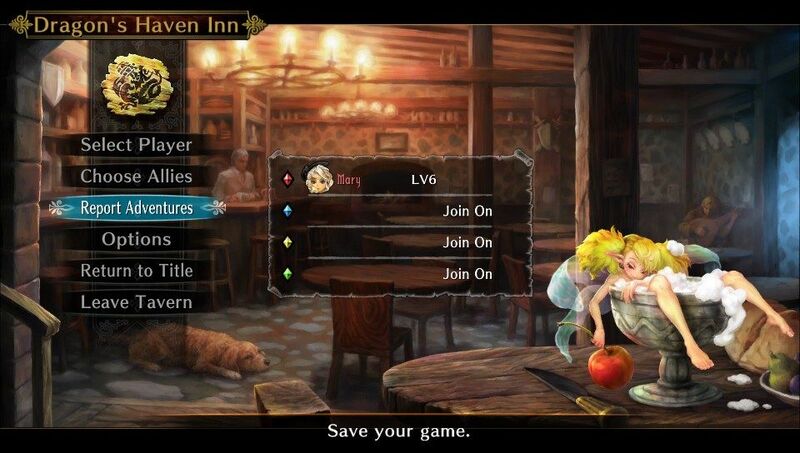 Dragons Crown is really designed for four players, but a solo player gets to pick up NPC allies along the way. 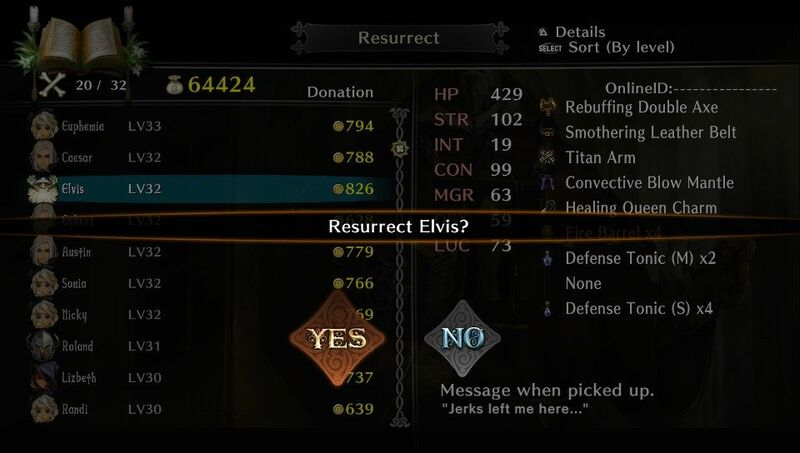 No, seriously, you pick up piles of bones representing deceased adventurers and bring them back to the town’s temple to be resurrected. Here’s me in an early mission with an Elf backing me up. 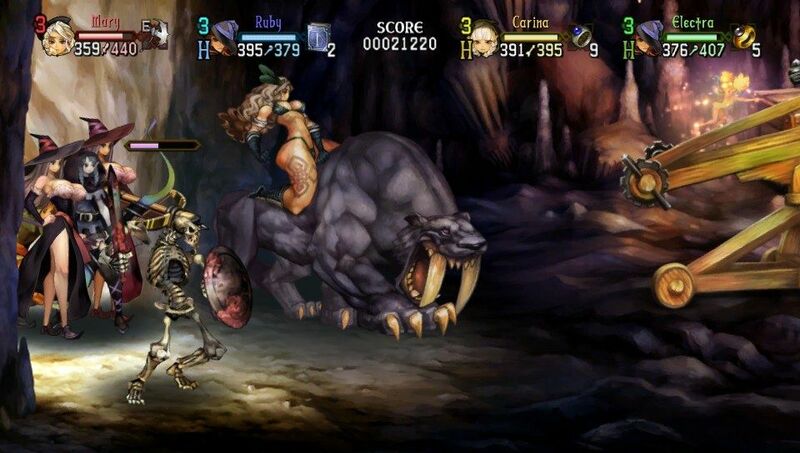 Note that I have picked up a giant saber-tooth tiger to ride. Note further that this is AWESOME and that the goblin on the right is about to… well WOULD be about to be eaten except that I am on the wrong plane to actually hit him. More saber-tooth riding action, this time in a full group. One of my NPC companions has turned a fallen adventurer into a skeleton pet. The best boss ever. Cute and fluffy and can insta-kill characters at will, coupled with a gruesome display of your bones being ripped out without any anesthetic. 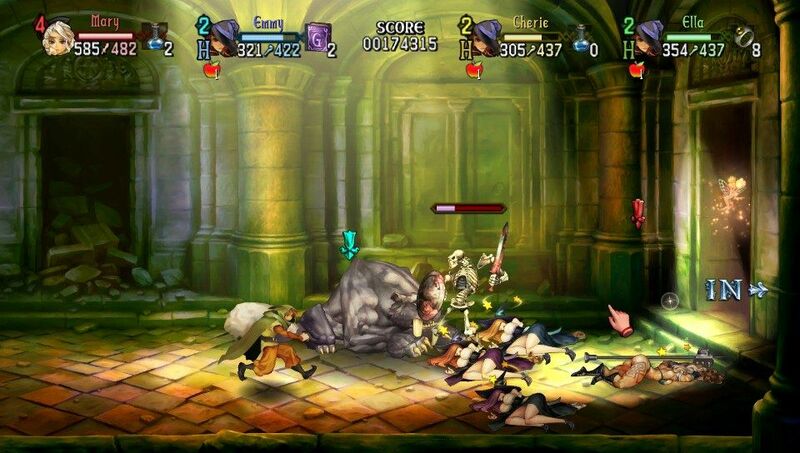 As mentioned, you pick up NPC helpers as piles of bones in the dungeon and drag them back to a temple for resurrection. The names seem to be chosen randomly from a pretty good name list and there are some unintentional moments of hilarity. Of course, you have a limited roster of NPC helpers and sometimes you need to clear out the old to make room for the new. So, let’s see. There are nine dungeons to be cleared out. Each of them has an “A” side and a “B” side, with the “B” side accessible after you have cleared all the A sides at least once. I found myself under-leveled for some of the dungeons as I was playing, so I couldn’t always go straight to the next-higher-level dungeon right after finishing the previous one, and I wound up repeating dungeons quite often. Fortunately, there are a ton of optional quests revolving around killing X creatures in Y dungeon, finding hidden rooms, bringing back magical artifacts and so forth. This helps relieve the grindy feeling a bit – sure, you’re going back into the Ancient Temple Ruins for the eight time, but you have a different goal this time. The story is pretty shallow. 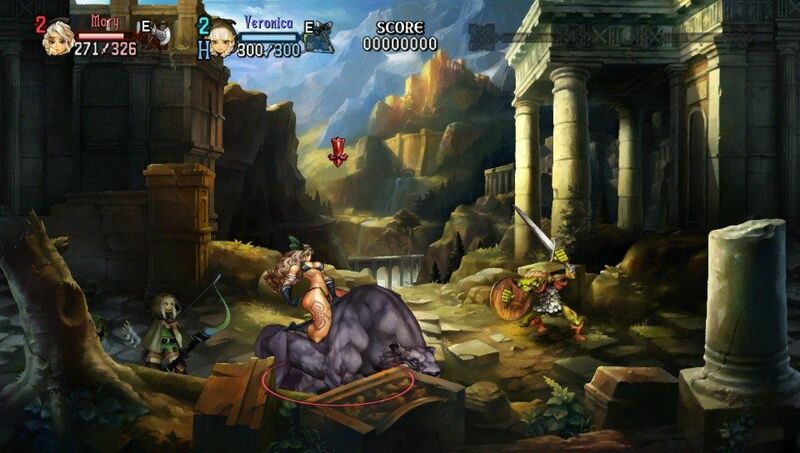 There’s a doohickey called the Dragon’s Crown, it has been lost, the king is missing, there’s some royal intrigue, you need to find the crown and save the world and – look, just get out there and start beating up monsters and taking their stuff, OK? 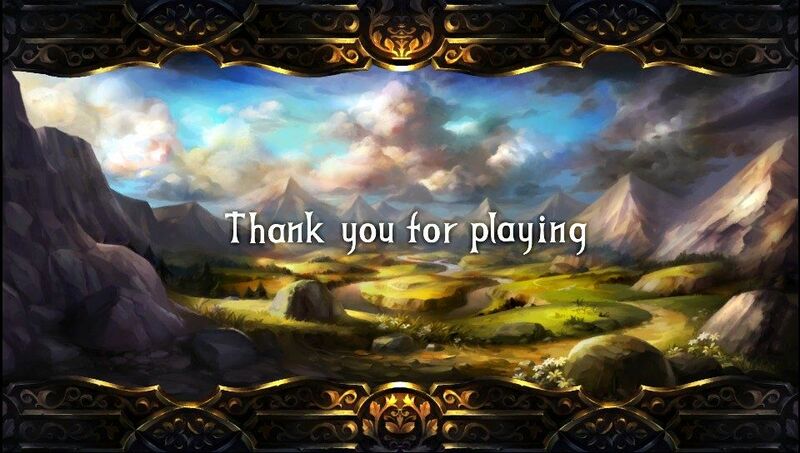 It took me about 15 hours to play through the game on Normal Difficulty. Some of the boss fights draw heavily from MMO encounter design, and I found myself needing to follow scripts to clear adds and light torches and fire cannons and all sorts of things other than press the Hit Things With Axe Button. This threw me a few times, especially with two or three bosses that turned out to be good old-fashioned DPS checks and would die to environmental hazards – so I didn’t get credit – if I didn’t kill them before the timer ran out.